Ash vs Evil Dead, a 10-episode half-hour series, is the long-awaited follow-up to the classic horror film The Evil Dead. The series is executive produced by Sam Raimi, Rob Tapert, and Bruce Campbell - the original filmmakers - and Craig DiGregorio who serves as executive producer and showrunner. Campbell reprises his role as Ash, the stock boy - now an aging lothario - and chainsaw-handed monster hunter who has spent the last 30 years a.. Season 2 roars into action with Ash leaving Jacksonville and returning to his hometown of Elk Grove, Michigan. There, he confronts Ruby. The former enemies have to form an alliance as Elk Grove becomes the nucleus of evil. 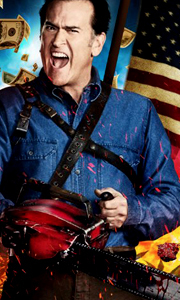 Special Features Audio Commentaries On Select Episodes, Inside The World Of Ash Vs Evil Dead, Season 2 First Look, Eight Featurettes..
Own Ash vs Evil Dead Season 2 DVD from Deff, DVD, Blu-Ray & 4K Video Specialists - Free UK Delivery..
Own Ash vs Evil Dead Season 1 DVD from Deff, DVD, Blu-Ray & 4K Video Specialists - Free UK Delivery..
Own Ash Vs Evil Dead Season 3 Blu-Ray from Deff, DVD, Blu-Ray & 4K Video Specialists - Free UK Delivery..
Own Ash Vs Evil Dead Season 3 DVD from Deff, DVD, Blu-Ray & 4K Video Specialists - Free UK Delivery..
Own Ash Vs Evil Dead Seasons 1 to 3 Blu-Ray from Deff, DVD, Blu-Ray & 4K Video Specialists - Free UK Delivery..
Own Ash Vs Evil Dead Seasons 1 to 3 DVD from Deff, DVD, Blu-Ray & 4K Video Specialists - Free UK Delivery..